Mercedes-Benz is giving the world the first glimpse at its upcoming X-Class pickup via an exceedingly dramatic video that looks like it took many months and many dollars to render. 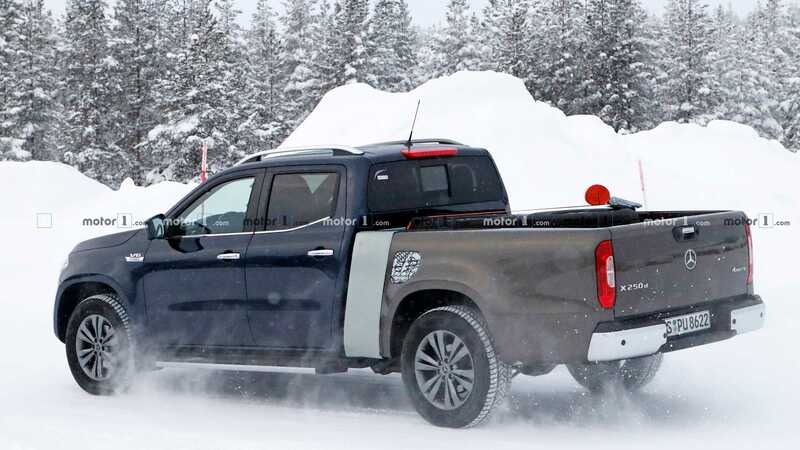 The 2018 X-Class will share components with the Nissan Navara pickup and use the NP300 platform courtesy of an agreement with Renault-Nissan. The midsize X-Class pickup was last previewed by two concepts at the Geneva motor show this year, named Stylish Explorer and Powerful Adventurer, that indicated what a Mercedes-Benz pickup could look like. Billed as the "world's first premium pickup," the X-Class will actually skip our pickup-friendly market entirely, aiming for the likes of the Volkswagen Amarok and the Toyota Hilux in other regions. The teaser video demonstrates that the production design has been watered down a bit from the concept, with the X-Class featuring a GLS-style grille with prominent horizontal bars, a tall hood and a front bumper with an integrated skid plate. The rear fascia will be fairly conventional, dictated by utility, with vertical LED taillights bookending the rear gate. Mercedes is promising that the X-Class will be aimed at off-road functionality rather than being a luxury road cruiser, and this means a live rear axle and a transfer case with reduction gears. Thrifty V6 engines will power the X-Class -- no AMG V8s in this truck -- with a turbodiesel V6 expected to top the engine range. Why isn't the X-Class coming here? A big part of the reason is production locations in Spain and Argentina; the chicken tax will make it prohibitively expensive to sell in the U.S. And it's not that Mercedes doesn't believe that it could sell the X-Class to a U.S. audience, especially amid a comeback of midsize pickups and a rush toward luxury trucks and SUVs that kicked off in the latter half of the decade. 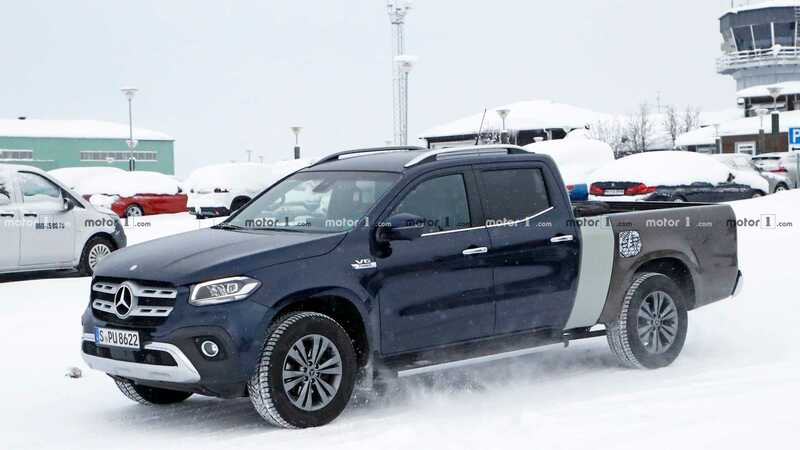 Mercedes made it clear early on that it intended the X-Class to be a rough-and-tumble working truck priced to compete with other working trucks, aimed at markets where a commute could require some casual off-roading. But the automaker hasn't ruled out bringing it to the States at some point in the future -- though it's clear that it will have to be produced here to be sold here, and setting up a production line takes time. The X-Class will be revealed globally on July 18 and enter production in 2018. Could this be a prelude to a U.S. debut for the luxury truck? That could actually be the crux of why this vehicle exists. A longer bed with more power under the hood would certainly appeal to U.S. pickup truck buyers, and Mercedes already supplies the latter with a turbocharged 3.0-liter V6 diesel making 255 horsepower (190 kilowatts) and 406 pound-feet (550 Newton-meters) of torque. There’s also the possibility that Mercedes engineers could fit the 4.0-liter twin-turbo V8 in the X-Class, but that would only happen if there was sufficient demand. Gotta camo that fuel door. Not sure I see the market for a F150 Limited-priced mid-sized truck. Even with the TTV6 (400-class) it'll be expensive. So, I'd think the X would hit the US in the $50-60k range with the GLE400 TTV6 & not have a huge market to buy it. This will fail so hard just like the Lincoln Blackwood, etc. Ford, Chevy, RAM, GMC will always dominate this space. I'm sure there are plenty of people in CA who would love a MB pickup truck. Shows that they have money and work hard for it. Those that need a truck to use it like a truck will continue to buy F150's, Silverados, etc. While the X would compete price-wise with the full-sizers here, it'd more of a comparison against the Ranger, Tacoma, Frontier, Ridgeline. Almost none of which would likely be cross-shopped against the X, price difference being a large reason, IMO.